Group portrait of the Non-Commissioned Officers (NCOs) of the 1st Brigade Headquarters at Meteren, France. 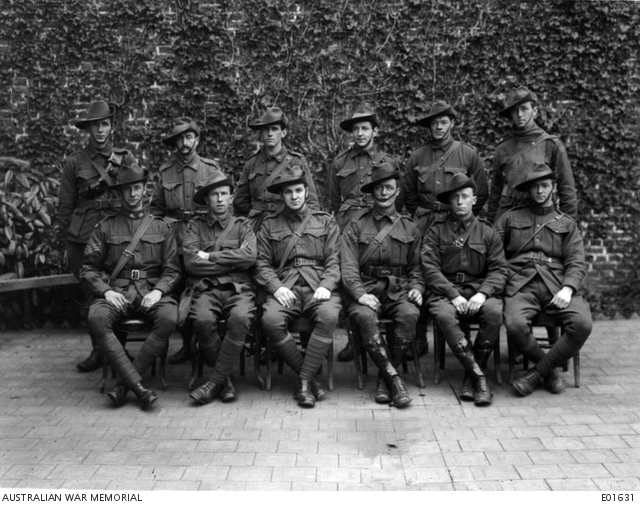 Identified from left to right, back row: 2844 Corporal (Cpl) Arthur Willacy from Parkes, NSW, transport corporal; 1834 Sergeant (Sgt) John Oakley from Northam, Western Australia, veterinary sergeant; 3270 Cpl Leonard Elliot Thomson MSM from Wagga Wagga, NSW, orderly room corporal; 1389 Private (Pte) Jack Sidaway from Woollahra, orderly room; 1432 Lance Corporal (L Cpl) Charles Richard Tatler from London, England, gas corporal; and L Cpl R Walton, signal service. Front row; Sgt Smith, gas sergeant; Sgt J Ready; 7358 Company Sergeant Major (CSM) Clarence Ray Thomas Sorrell CSM from Keswick, South Australia; 2389 Quartermaster Sergeant (QMS) Gerald Carroll from Rozelle, NSW; 76 Sgt Clement William Brindley from Auburn, NSW, signal sergeant; and Sgt Sackett, postal sergeant.